This engaging introduction to Dorothy Day will show you how one person can accomplish big things. This colorful book introduces you to the world of Dorothy Day, one of the most amazing people of the twentieth century. You will be inspired as you learn about Day’s life—from her efforts to further peace and equality as a young woman to her work helping the hungry and homeless with food, shelter, and unconditional love—and her belief that we all have the power to make the world a better place. 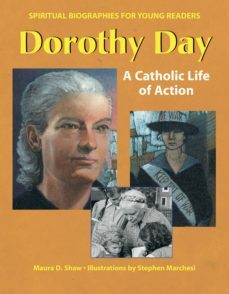 Through enjoyable biography, activities inspired by Dorothy Day’s values and beliefs, and Day’s own words, Dorothy Day: A Catholic Life of Action will show you how to stand up for your beliefs and lead a life that inspires those around you to do the same.